All "framed" images are linked to desktop sizes. I think I may have injured my Bolivian ram with dry fertilizer. I do EI fertilizer dosing in my display tanks with dry fertilizer. I generally dose K2SO4, KH2PO4, and CSM+B, and let the fish take care of providing the NO3. Shortly after I dosed my 120 gallon a few days ago (following the usual 50% water change), I happened to walk by the tank and notice that my male Bolivian ram was not with his mate (quite unusual; they were a breeding pair and generally don’t wander far from one another). After a few moments, I spotted him lying on his side, still breathing (a bit rapidly, but not gasping) and still moving his pectoral fins. He’s full grown; I’ve had them both for about four years, and I thought perhaps he got in the way of the ferts and got stunned, so I left him there to see if he’d recover. 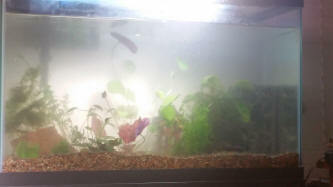 Parameters in the tank were 0 ammonia/nitrite and between 10-20 ppm nitrate. Temp was between 74-76F (room temperature in my house), pH 7.2, gH and kH in the 50-100ppm range (I use remineralized RO/DI water so my parameters are very consistent in that regard). A few hours later I checked on him; he’d moved a bit, swimming backward and still on his side, and wedged himself between two stems of Rotala. He was still breathing and moving his pectoral fins, his color was good, and he didn’t appear bloated or have any visible signs of disease or injury other than his lack of buoyancy control. His mate seemed to be watching over him anxiously. I left him there, and hoped for the best. The next day he was in the same spot, and I assumed he had passed ... but when I went in to remove him, he swam away — still upside-down. His condition was no better or worse than the day before. However, at this point I decided to put him in quarantine to see what I could do. He’s now in a bare bottom tank with the same parameters (little to no nitrate) at 80F and 2g/L NaCl; so far, no change, but he does seem to be swimming a bit more. If I set him upright, he does the ‘belly scoot’ for a moment and then falls over again. Before I start throwing meds at him, I figured I’d check with the experts so I don’t accidentally make him worse. I haven’t tried feeding him, but I doubt very much that he’ll eat in his current condition, and I know the first-line treatment for swim bladder issues usually includes fasting the fish. Photo included in case you see symptoms I missed. Sorry about the lighting; my QT and hospital tanks are inside my stand. Neale says your the plant expert. Can you answer some questions about some plants? I went to 45 minutes far away plant store to buy some Watersprite. They had so many pretty plants.. i was trying to stick to ones I researched but I let the advice of their plant guy be enough. He said the red tiger lotus does well in his low to medium light tank. I bought several plants I didn't know anything about due to its such a long drive, I know I should have researched more...but the guy said they would work. I had also bought some at a nearby pet store so now the tank is pretty full. I was having some algae issues so I am trying to clean it a little more frequently (25% partial water changes), sprinkle the food lighter, and to add a lot of plant life planted into some fluorite that I buried under some of the gravel to hopefully outcompete the algae. Will the red tiger be useful in this purpose, or harmful to growth of my other plants? I have some crypts, Anubias, that grassy patch at the front, Bacopa and something that looks similar to Bacopa, and Anubias and java moss, and water sprite. I had the Anubias the longest but it grows so slow, it gets algae. And also, please identify the stringy long stemmed green one floating behind the red tiger lotus? That one has roots and not a bulb. I also added a photo of it from above. And also, what's this one that's floating at the top? I don't think its Bacopa. Also, can you identify this little grassy parch thing? It was sold as tissue culture and no name. I have a strip of LEDs, and then I bought a plant lamp from IKEA. I think they're each about 20-25 watts. I hope the plants will do ok! I did research on low light plants but the one floating at the top, the red tiger lotus, and the tall green floaty thing behind it were my impulse buys. Store employees keep tanks and told me of their own luck with them. Sorry, I forgot to attach the other photos for you to id. Here you go. Well, I've clearly made a huge error in judgment impulse buying that beautiful red tiger lotus. There seems to be a general consensus that it will quickly overtake a tank and the roots go under all the other plants roots making it difficult to extricate. Some people prefer to grow these beautiful plants in ponds instead of aquariums because of their growth rate. But the difficulties of planting a red tiger lotus in an aquarium are easy to overcome. Thank you Bob!!! That's awesome. I'll try that. I love this beautiful plant and this 30 gallon really is the best tank I have to fit this size of a plant. Your i.d. 's are missing from this thread below. Will you please try again sending the email where you i.d. 'd them? I have wild harvested South American Lime Green Endler's. 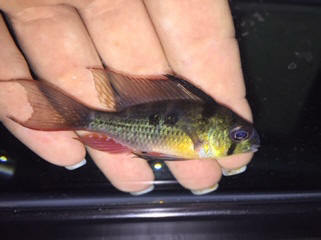 The Endler's do not eat their young. I have very much been wanting to add Cherry Shrimp to the tank, but worried that they might possibly chase the different species fry. Can you recommend a good grassy plant to spread and carpet the front, and or is that one I have decent? Thank you Bob, I'll check out that garden site. I have followed you for a long time. I wanted to ask about Anubias melt. It seems that searching on the internet there are very few hard leads to the cause. I have noticed it mostly in plants that were grown emersed in fiber glass. There are few major outward signs which plants that suddenly turn to mush. A few very green leaves might drop but little else. The plants are shaded by a large piece of drift wood and placed between rocks. The melt occurs in the first 2 weeks of being in the tank. <This does sound like typical plant 'shock' rather than some specific disease. If possible, remove the dead leaves carefully, but leave the stolon in place. Do ensure the stolon is absolutely clear of the substrate or any sort of fibre glass wool. It should be placed on a rock or bogwood root somewhere that it is able to get some light so it can photosynthesise (that's why it's green) and after a few weeks you should see some new leaves. I find Anubias recover from damage rather well, all else being equal. 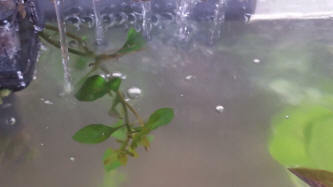 Do review water chemistry, though Anubias barteri at least will adapt to a very broad range, from blackwater conditions through to slightly brackish. Other species might be more picky. Finally, do try removing one of the plants (or a cutting from a stolon) to another tank if possible. No other additions melt or lose leaves including my crypts. 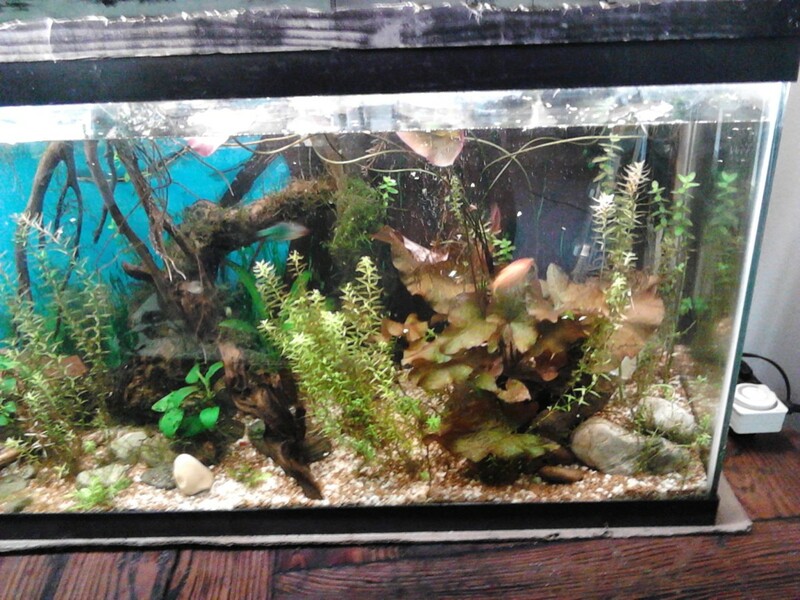 <Anubias do enjoy similar conditions, and I've not observed allelopathy between Cryptocoryne and Anubias. Usually, they thrive when grown together. Where else would you have me look to discover an answer? Just got a few questions for you hopefully you might help me out. My concern is that behind the walls will it become “dead spots”. The fish do go behind which I’m hopefully going to stop soon and give the shrimps that are in there a place to live “behind the scenes” once all the walls are complete. Do you think this will be an issue with dead spots? Hi, My name is Larry. 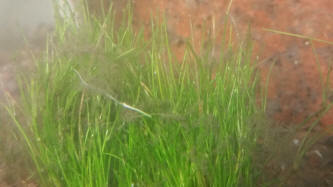 I purchased some aquatic plant weights for our 20 gallon freshwater fish tank. 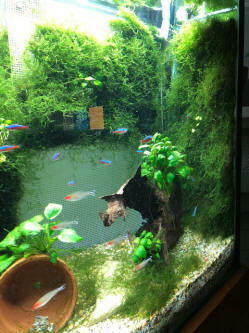 Our tank is about 2 months old and we have 5 guppies, 2 catfish, 2 frogs and 2 snails. We also have 1 piece of driftwood and a few live plants. I received these plant anchors from Awesome Aquatics and I think because I forgot to rinse/soak the anchor/weights prior to putting them into our tank last night and woke up this morning with a cloudy tank? Should I wait and let the filter run its course or should I do a 25% Water change? I hope to hear back from you soon. <This could also/otherwise be a coincidental "bacterial bloom"... a profusion of microorganisms so dense that they obscure light penetration. FYI - I had the driftwood and plants in our tank 1 week prior having any fish. Like I said in the prior email, all was good until I put the lead strip weights on last night? I did the water change and it cleared up a little bit still cloudy! I did check the water and PH is low so I added PH up (API). Thanks again for you advise and hope to hear from you again . I just got into to getting used to a planted aquarium. My tank is a bare bottom one with Angles and a discuss. I added some black soil to one corner of the tank and got moneywort plant which was rooted in a small plastic cup. My LFS asked me to place the soil in a bowl and place the plastic cup along with the plant in the soil and place the bowl in the tank. But instead I have placed the soil directly in one corner of the tank and placed the plastic cup half submerged in the soil. I have my tank light running usually a few hours in the morning and a few hours in the evening. I can see that the plant looks pale before the light is switched on and once after the light is switched on, it seems to look a little better. But I still feel that the plant may not be in its best health. 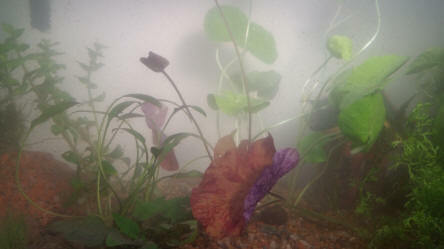 I can also see some leaves floating around the tank once a while. I do not have a CO2 system for the tank. Please guide me in what can be done for the better health of the plant. Yes you are right its kind of a small "plastic cup" with holes in the sides. I am now looking at increasing the period the aquarium light needs to be switched on to around 8 hours. <Oh, definitely, BUT do remember: long light period is not a substitute for brighter light! 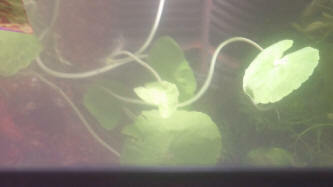 Plants each need to certain intensity of light to grow. I have the heater temperature set to 26 C that is around 78 F. Do I need to make any changes to that. I currently house Angels and a Discus. Mine is a 10 gallon. My Angels and Discus seem to be nipping the moneywort. Is this common. weather loaches to help keep the nitrates under 20 ppm. They're beautiful plants and I did my research, so I think my situation will suit them very well as far as lighting, temperature, and water parameters. Also, the loaches love playing with them. They push them around the tank in what appears to be a game of "fishy soccer." One fish pushes the plant around until another fish sneaks up and steals it away to push it in another direction. It's actually fun to watch! But a friend of mine who saw them playing their game told me I should not let them do that (Seriously?) because as they push the plants around the surface of the water, and sometimes pull them under for a brief moment, will flood the plant. He told me the top of the plant cannot get wet or it will rot. Is that true? If it is true, I'll have to remove the plants, but they seem to have very waxy leaves and I don't see the water penetrating through that - but you have the final say! Great! I didn't want to take away what has become the loaches 2nd favorite toy (they love "surfing" in their powerhead current the best.) I don't know if they are Pistia stratiotes, but they look like the pictures of that species in the photos I've found online. I was down at a local pond store and they had this tub of what they called water lettuce outside in their nursery area. Evidently the remaining plants did not sell over the summer, so the store was going to leave them to freeze to death over the winter (stupid, stupid, stupid). Most of them were already dead and rotting (our overnight temperature has been down in the upper 20's for the last couple of weeks) but I was able to salvage 14 plants and I've put two in each tank (4 in the loach tank) because I understand that they will reproduce quickly once fully recovered. I don't understand why they're not more popular in aquariums as they are a beautiful, low maintenance (no Co2 required) plant, and fish love them!. 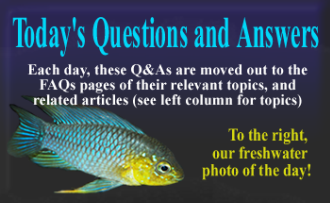 Great information - my aquariums don't have the standard aquarium lights on them. Mine have your regular fluorescent lights (a solely economic choice) with plant bulbs in them. They hang about 4 - 6 inches off the top of the tanks. 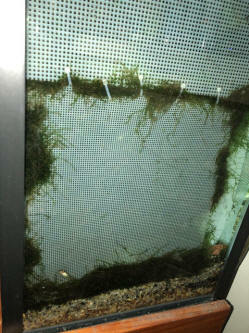 The lids on my tanks are not standard glass lids either (all of my tanks have "obligate air breathers" in them loaches, rope fish, Senegal bichirs), so my lids are egg crate covers (normally for fluorescent lights) cut to fit the tank with 1/4 inch squares, so there is a certain amount of light diffuse and air circulation, but I can still maintain 51% humidity in the tank. above that you think I should change/adjust? Great! Thank you again! Have a great day!